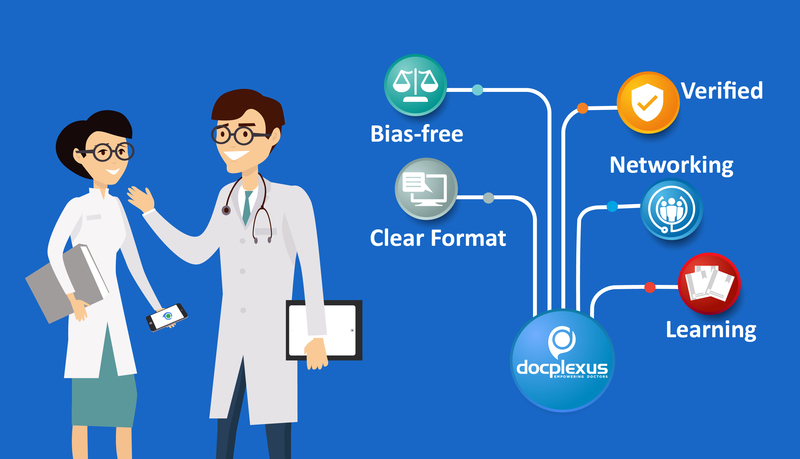 Docplexus is a social networking site which claims to be the largest network for Indian doctors. They have a dicey sign up policy, aka where they sign you up without your knowledge and you cannot unsubscribe. I wrote a comment on their celebratory LinkedIn post pointing this out, and they promptly deleted it, causing me to rant on my blog (which, unlike Docplexus, is not read by anyone but my friends, who happen to be real persons!). If you are a doctor with a social media presence, you must have heard of the Docplexus site. They are, arguably, the most well known, or at least, well publicized, social networking site for Indian doctors. I started receiving emails from them, sometime last year. At first, I did not mind, as the content was really good. There were engaging posts which caught my attention and it acted as a blog aggregator, which I could read without signing up for an account. Little did I know that unknown to me, an account had been opened in my name, and I had been signed up on an email list I did not join by myself. Over time, as is the wont, the quality of the posts started to deteriorate. As good quality newer posts started to dry up, older and more popular posts (for example, this viral post by Dr. Roshan) kept being recirculated. This was too much, so I decided that it was time I disengaged. Unfortunately, there was no way to unsubscribe from the emails! That seemed quite logical – why would there be an unsubscribe option for a mail list I did not even subscribe to? So, I did what every sane person does – I went on their site, logged in (I must have acceded and obtained an account at some point – or they volunteered the account for me too – I do not know what happened) and turned off their email notifications. I thought that was that, but no! I kept receiving bunches of emails, as though nothing had happened. I complained on Twitter, I wrote them an email, I wrote on some forum for complains… the works! No use. No response from anywhere. What eventually worked was that I wrote to their info@docplexus.in email address demanding to be removed. They were nice enough to delete my account, unsubscribe me, and told me that they would look forward to helping me out again in the future. Done and dusted, right? I thought I must have been a one off case. But clearly it was not! In fact, just yesterday, I received a tweet from a similarly frustrated unwitting subscriber! I know I am a crabby person who has a lot of issues, but come on, I have found at least four other persons who were also, like me, unknowingly signed onto this mail list. Anyway, so what prompted me, after so many moons, to revisit this non-issue? The thing is, the CEO of Docplexus recently posted on LinkedIn, boasting that they had signed on 250,000 users – which is a remarkable achievement in itself. However, rabble rouser-in-charge, Dr. Soumyadeep, decided to comment on their “unethical” practice of signing up users without their explicit permission and tagged me in. I left, what I thought was a positive criticism. I said pretty much the same thing that I have said here, till now. To my surprise, the comment was deleted. In fact, ONLY the two critical comments were removed, while the other “congrates” type of comments stayed up! I was a bit peeved and felt that this was a clear case of censorship of expressions or opinions: the very LAST thing that a social networking site should be doing. If anything, they should be the ones providing the platform for dissent and disagreement, a safe space for professionals to come together and discuss things, issues that they might not always agree on, or see eye-to-eye on. After this unfair attempt at censorship, I decided to leave another comment and see what happens. This time, Soumyadeep kept a screenshot, much to his credit! Guess what happened after this? ALL comments were removed and comments on the thread were disabled. More than a bit disappointed, I decided to do what I could – complain and crib on my blog. So, at this point, you might be asking me what is with all this fuss? Why not just mark them as SPAM and be happy that the emails just go to the junk folder without bothering me? Why not let Outlook or Gmail spam filters and blocked email domains take care of the rest? I think that is not the point here. This is an argument from a moral standpoint – they are free to sign me up to any newsletter (within limits!) as long as they provide me with the option to unsubscribe from them at my will. Docplexus emails do not allow you to do that! They not only sign you up surreptitiously, but keep you hung out without an option to unsubscribe, thereby falsely inflating their subscriber counts. I really want to understand how many of the 250,000 doctors on Docplexus are actually active and contribute even once a week to the site in ANY capacity. Because that is the real metric of engagement. An account count can be created with fake credentials quite easily, and without much human work involved either. I am not saying Docplexus has indeed faked a bunch, but they have, for sure, added me without my approval. And if they have indulged in some shady practices to pad their bottomline, they might have not strayed far from the moral compass that the dubious email sign up industry follows, but in my book, it is just not done. Hence, a long rant to call out Docplexus for following slightly dicey promotional practices, which, at best, are inflated claims of marketing for the medical community, and at worst, are unethical marketing practices infringing on the privacy of the professionals. I do not know where, along this spectrum Docplexus lies, but for sure, there is room to discuss ethical behavior on behalf of social networking sites. But, you know what has irritated me the MOST, in all of this saga of irritating affair? The fact that they deleted my comments. As a social networking site, that is a transgression I cannot overlook. Sorry Docplexus, I am done with you. Whatever little interest I had in your services, were deleted when you deleted my comments and then disabled comments on the thread. For those who are reading this, what has been your experience? Will you try to convince me that I am wrong and I should have more patience with a fledgling startup that is serving a very niche audience? Will you side with me that you are tired by the spammy, repetitive emails they send out? Will you be outraged by the fact that the CEO sees it fit to delete comments and censor opinions about his site, which should promote dissent and disagreement? Feel free to leave a comment, I won’t delete them, I promise (it will be cool if you are nice and civil though!). Tags: Blog, Blogging, docplexus, medical blog, social network, social networking. Bookmark the permalink.